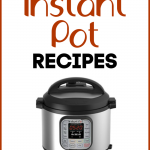 Today is Day 1 of 31 Days of Instant Pot recipes! Hooray! Who’s excited? For day 1 of this project I really wanted to share a recipe that I use all the time and love. It’s for basic shredded chicken that’s somewhat seasoned. I make this recipe all the time in the slow cooker. 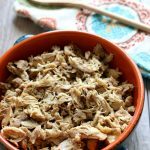 It’s like rotisserie chicken that you can eat plain or you can use it in other recipes like Chicken Tetrazzini or Healthy Chicken Barley Soup. 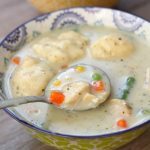 One thing about this recipe is that I threw the chicken into the Instant Pot totally frozen. If you have defrosted chicken the cooking time would be the same but it will take a lot less time to heat up the pressure cooker. The cooking time on this recipe is only 30 minutes, however it took the pot about 25 minutes to heat up and then 10 minutes of releasing the pressure naturally. So the total time in the pot was about 65 minutes. So just FYI when you see all these Instant Pot recipes that say “cooks in 30 minutes” that may be somewhat true but it’s a little deceiving since you have to wait for the pressure to build and then the pressure to release. We ended up eating this chicken just plain with baked potatoes and salad. And then the next day we had the chicken on top of a salad. I like to buy my boneless, skinless chicken thighs from Costco. They have them in the frozen section but I’ve noticed recently they also have them in the fresh section. They are usually less than $2 per pound. For this pressure cooker shredded seasoned chicken I used this Instant Pot IP-LUX60 V3 Programmable Electric Pressure Cooker. It’s 6 quarts, so the same size as most slow cookers. It cost be around $80 on Amazon. My pressure cooker took almost 25 minutes to come to pressure since the chicken was frozen solid. Then it took 30 minutes to cook. And then 10 more for the pressure to release naturally. So total time from start to finish was around 70 minutes. We use it for quick meals with flour tortillas, lettuce, tomatoes and onion with salsa. It also works well with corn tortillas or the store bought taco shells. Thanks for sharing your ideas Ed! Would the cooking time be the same in an 8 qt. IP? yes I would keep it the same. If I cut the recipe in half, do I still use 1 cup of broth? If you’re using frozen chicken you don’t need to because the chicken has a lot of water that comes off of it. Otherwise, yes. Hello! If I’m using frozen boneless skinless chicken thighs but I’m only going to use about 1 lb is it still 22 min cooking time? What about the cooking time for fresh? Still 22 min? 22 minutes will give you very very tender shredable chicken. If you want it more sliceable then I would do closer to 15 minutes. My family loved this chicken! It’s delicious and versatile! Thank you for sharing! versatile is the right word for it! Thanks for the great recipe! So helpful as I’m new to the Instant Pot. I love to shred my chicken in my stand mixer. Just throw the chicken in there with the paddle attachment and turn it on low. It will shred the chicken for you. This is wonderful! 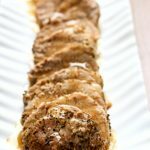 So full of flavor and easy to prepare! It is certainly going in my “keeper” file! Is the chicken placed into the water, not on a trivet? Is there broth left over after cooking? I have done both ways…on the trivet or on the bottom of the pot. It doesn’t really matter much. There is quite a bit of broth. I learned the hard way not to mix thighs and breasts in cooking., because of the different cooking times required. In the future, I will cook all thighs for 20 minutes and all breasts for 12 minutes. I added 12 peproncini, stems removed to the pot and it provided a milk kick. At the end, I took the cooked chicken out of the pot. I puréed the remaining broth and chicken. Very yummy! How long do you cook no frozen chicken breasts? Your recipe says 22 minutes but comments say 12. 12 minutes would be great for not frozen chicken breasts. But it you’re using thighs do the 22 minutes. Hi I don’t have bullion granules can you please tell me the equivalent amount of “Better than Bullion Chicken base ” I should use? Thank you, I love your site, you have helped me learn to use my Instant Pot and my kids like your recipes. Hi you can just use 1 cup of chicken broth in the place of chicken bouillon and water. Hope this helps! I use about 1 tsp. per cup of water and ALWAYS use Better Than Bullion. I wish I had read further into your post. I used all fresh chicken breasts and cooked it for 21 minutes. Am right in reading that I should have only cooked them for 12? Well maybe next time. Well, how did it turn out? Hey Karen! I love this recipe and have made it before. What adjustments would you make if you were using bone in skin on chicken? (That just happens to be what I have on hand) thanks for your great recipes! Thanks for another great easy recipe. 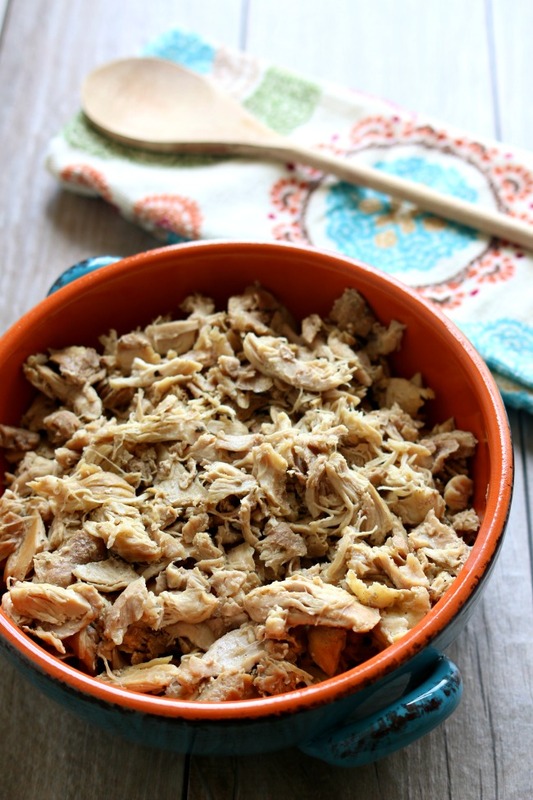 Most shredded chicken recipes I’ve come across are bland and flavorless. This was very juicy and perfectly seasoned. Delicious!! I’m so happy you tried this recipe. 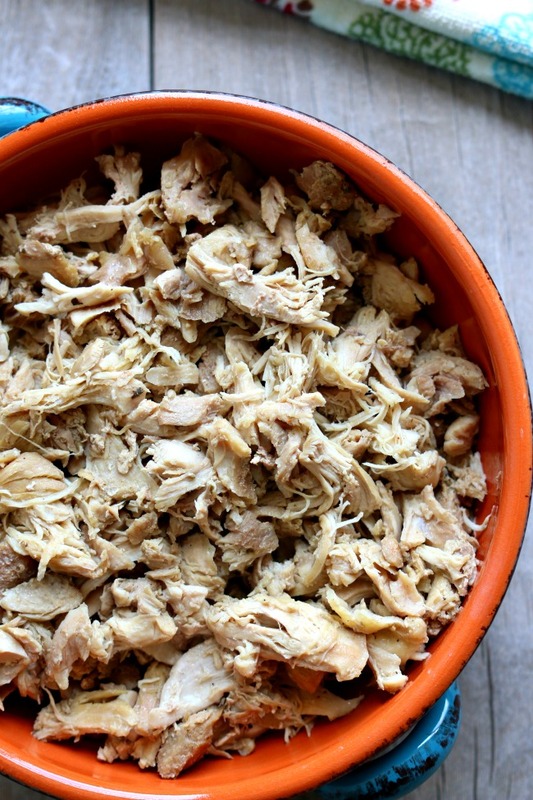 I think it is so delicious and I wish more people would use it as their basic shredded chicken recipe. So if I am using all frozen chicken breasts instead of thighs I reduce the time from 30 mins to 12? Just want to confirm because I am going to be making this tonight? If it’s individually frozen chicken breasts then you can cut the time down to 12 minutes. If it’s a frozen block of chicken breasts then cook for 15 minutes. Here’s what I don’t understand. 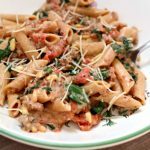 This recipe is written for a specific instant pot, what if you don’t have that particular one? Mine is a 3 quart which has venting written on both sides of the pressure thingy and seal is having it straight. I’m just LOST. Just got this little one for Christmas and have never used a pressure cooker of any kind and I’m 62 years old..
Hi Cathy, Just point the valve to the middle part where it says “sealing.” I also have one like that. Sorry I wasn’t more clear. Can you use all boneless skinless breasts if you don’t like thighs? yep, but you’ll cut the cooking time down to 12 minutes. Just made this recipe and it turned out amazing! I used all boneless skinless chicken thighs (fresh not frozen). My family and I were eating the chicken right out of the pot like candy it was so good. Juiciest chicken I have ever made, fell apart with a fork. Thank you for sharing! 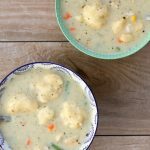 I love this recipe so much too! It is my favorite. I love my Instant Pot. I have the same one you have and use it regularly. I’ve made the seasoned chicken and it works great. Also, pork roasts will fall apart for my tamale filling. I made beef stew last night in it. Tonight I am making BBQ’d beef ribs. I put the trivet in and add apple juice (when I have it) as the liquid for steaming. I stand the ribs up and bend them around the inside of the pot. I also rub them down with our favorite rib rub or use a package of buffalo wing spice seasoning. Once they are cooked, I slather them in our favorite BBQ sauce and put under the broiler to carmalize. Hubby loves them and has asked if I should buy a 2nd IP just in case the first one quits. Cammy, those ribs sound amazing! I will have to try them soon. My husband would love them! I used beef for the ones last night but prefer pork. I use the “beef/stew” setting and add enough time to reach 36 min. cooking time. If you use the regular, wide/tall pork ribs, I cut the extra meat off so they are all the same heighth and lay the cut off piece on the trivet. I normally let it release pressure normally for at least 10 min. then finish with quick release. Give yourself 8-10 min for them to broil and carmalize that sauce. I am excited about this new series. I have tried using my pressure cooker in the past but nothing seems to come out right and the “cooking” time is so deceiving since there is a build up time and a cool down time that no one ever talks about. I know! I am going to put a note at the bottom of each of my recipes that says how long it took to build the pressure and then how long after the cooking time it took to be able to open the pot. I hope this helps! Thank you for this series – it will get my “pot” out of the closet! I’ve also been annoyed at the lack of clarity about the pressure build up and release – not as quick as they imply. I’m glad you’re adding those factors to your recipes. Good Jo Anna! I’m hoping to be transparent and helpful to people. 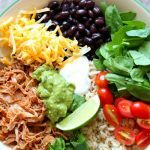 I’m just getting familiar with my Instant pot and all of this sounds so great! So I’m wondering about those hard boiled eggs. How do you make them? set your pressure cooker to Saute while you are putting your ingredients together … think of it as pre heating the oven. Now your pot is hot when you set the timer for the pressure cooker and it will come to pressure faster. remember you have to turn saute off before you turn pressure on.